PORTLAND, Ore. – Housecall Providers, a nonprofit whose medical clinicians make house calls to more than 1,000 homebound patients a year, has been selected by The Oregonian as the First Place winner in its Small Companies category for “Top Work Places” in Oregon and Southwest Washington for 2012. Housecall Providers was also named the “Top Meaningful” company. The selection was announced Sept. 12 at a dinner event at the Governor Hotel in Portland, OR. Some 939 companies were either nominated by their employees or were invited by the Oregonian to apply for the awards. Housecall Providers, which was nominated by an employee, placed No. 1 among 76 small companies that were reviewed for excellence. A consulting firm interviewed employees about their level of satisfaction with their workplace and the selections were made by the consulting firm based upon a scoring system designed to eliminate bias. 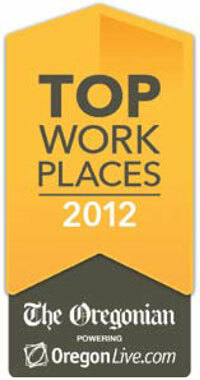 This was the first year The Oregonian recognized organizations with its Top Work Place competition. 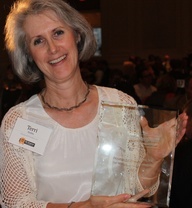 Executive Director Terri Hobbs happily shows off the Top Small Work Place award. Housecall Providers was founded in Portland, Ore., in 1995 to provide primary medical care for persons who are homebound due to their medical conditions. It has grown steadily through the years, and now employs nearly 80 people. Its physicians and nurse practitioners made more than 12,000 medical home visits last year, and its hospice service, which was launched three years ago, continues to provide end-of-life care tom ore patients each year. To find out more about the award, read the special section produced by The Oregonian for its Sept. 16 edition.